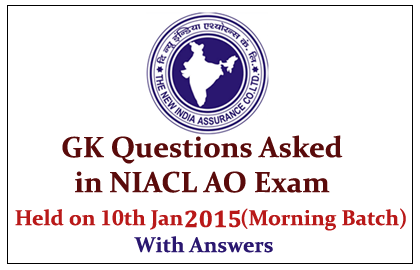 List of General Awareness Questions asked in New India Assurance Co. Ltd Administrative Officer examination held on 10thJanuary 2015 morning batch. Candidates those who are preparing for this examination can use these questions for practice. Among the following which country has the highest literacy rate? How many years do the commercial paper is valid for? ASEAN Summit 2014 was held at? In GST, ‘G’ stands for? Name the Australian Opening cricketer who has completed 1000 runs in 2014? Where the headquarters of International Labor Organization was located? Which Singer has got the Life Time Achievement Award recently? What is the name of the Pune University? China has launched a Satellite with Association with which country? Who is the Snooker Champion? Where the Great Himalaya National Park was located? Telengana has how many states as its border? PFRDA comes under which types of Organizations? JK Rowling has also written a book using another name, what is that name? What is the new name of the ING Vysya Insurance? As per Census 2011, What is the India’s Population percentage compared to world’s total population? ONGC has signed an agreement with which company for the New Zealand Oil and Gas Search Mission? Which of the following sports was related to FIBA? Who is the present Defense Minister?